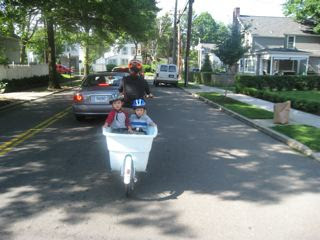 I was very excited to learn that recently another family cargo bike has arrived in New Haven. 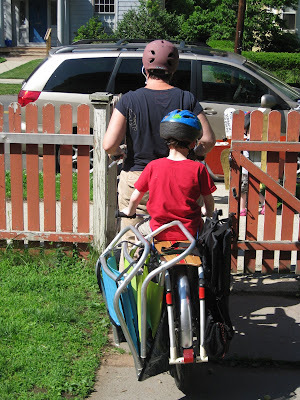 During our two years here, I've seen a number of bikes with baby seats on the back, others with trailers been pulled behind, and even some of those trail-a-bike things so-- yes, there has been a family biking scene, albeit small, that's existed in this city. 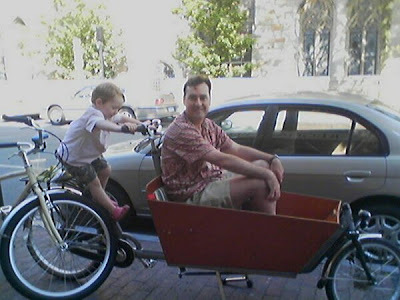 However, when our bakfiets arrived in February, it seemed to be the first one around (although I heard from Henry in Amsterdam that the company may have shipped one to New Haven some years ago, but I haven't seen it or heard any other reference to it). I asked Martina from Clever Cycles to mail me some of her business cards because folks were stopping us on the street to ask about it, and I was hoping that some other Elm City families would join in on the fun. I enjoy talking with anyone who shows even a glimmer of interest about what a terrific experience we have had family bike commuting. And the more I am out there riding and the more I am meeting other cyclists, I have been heartened to discover that there are other local, like-minded families. And here's one with the brand new Madsen. WOOO-HOOO!!! 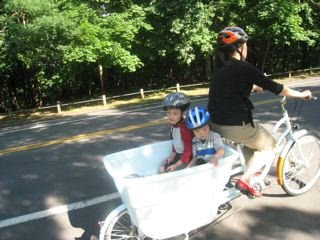 I am looking forward to a family ride meet-up with this crew and just maybe, I can convince them to contribute a guest post on their experience. Happy Father's Day, one and all. A special shout-out to my babydaddy. My sons are so lucky to have him as a dad and I am lucky that he agreed to have kids with me. I honestly don't know a man who is a better father than this guy. I am a big fan of memoirs, creative nonfiction essays, and documentaries. When I was teaching high school English, some of my favorite courses were the nonfiction electives I got to create and teach. I believe strongly in the idea that everyone has a story and our stories are often far more interesting than fictional ones. My friend Dan posted this picture to his Facebook account and I immediately asked him if I could use it for my blog. It would be fun to make this "Every Bike Has a Story" a regular feature here, but let's see how it evolves. 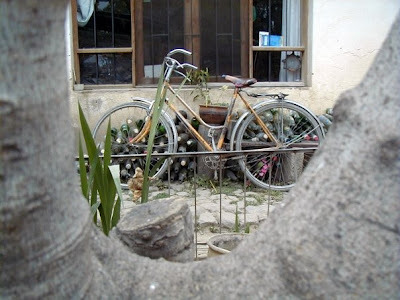 This is a photo of Dan's father-in-law's bike, taken in Cochabamba, Bolivia. 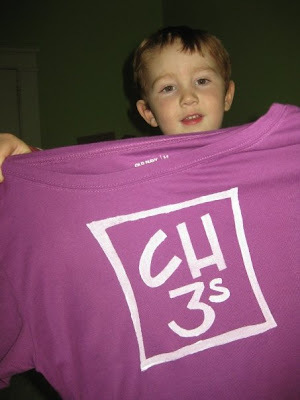 "[This photo] was taken 5 years ago (perhaps to the day - we were here for Santiago's 1st birthday, and he turns 6 a week from today). I think the bike has since been stolen. If not, it's at least been retired. Don Raul, then 80, used to ride it each day to the market, but the family convinced him to stop after a parked car door opened into him one day and sent him sprawling. He's recuperating from a broken hip right now after falling off a ladder in April (he's a tough 85-year-old), so his cycling days are behind him. The bottles are gone now, too -- my in-laws then had a tiendita in the house, but they've closed it." Happy birthday to me. 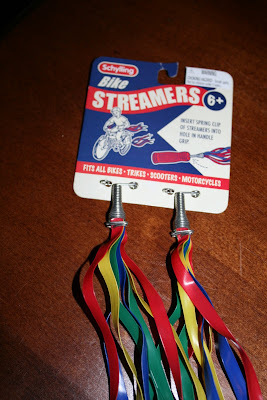 More snaps to follow once these gorgeous streamers adorn my bike. We were looking forward to yesterday evening for many months. 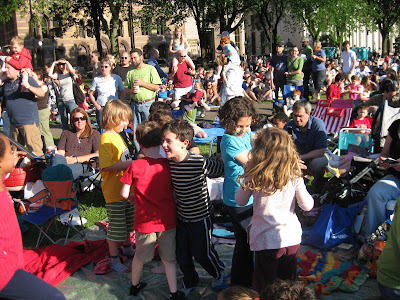 New Haven's International Festival of Arts & Ideas had They Might Be Giants come and play a free family concert out on the Green. We told all our friends that we would head downtown at 4:00pm with food for a picnic potluck and that they should just look for our bikes and yellow TMBG foam hands that we got as a free give-a-way when we went to see them in NYC earlier this spring. The past week has been incredibly rainy and Sunday started out grey and foreboding. Thankfully, the sun broke through about 3:00 pm, just as we were rushing around, getting numerous quesadillas cooked, bakfiets decorations painted, and boys ready. 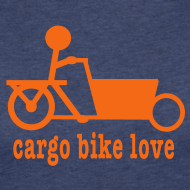 We were most happy to have two cargo bikes as we loaded all our gear. Here's the xtra with one rider, one passenger, two Crazy Creeks, two beach chairs, and a number of water bottles. I was bummed I didn't get a snap of the baks loaded up with two boys, three bags of food, a folding chair, etc. 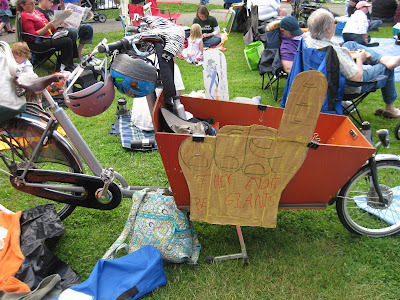 We made our way to the Green and got quite a few inquisitive stares, likely due to the bikes brimming with kids and stuff and our special 'foam hand' bakfiets' decoration. 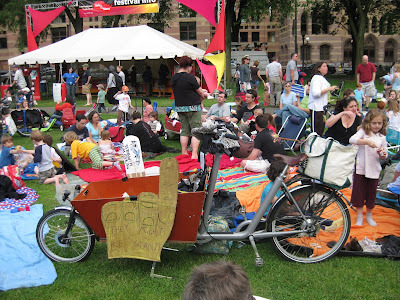 Once we arrived at the Green, we parked the two cargo bikes on either side of a relatively open space, anticipating a number of friends to join us. As the crowd thickened, it seemed that our well-marked bikes did the trick as family after family we knew joined our staked-out territory. 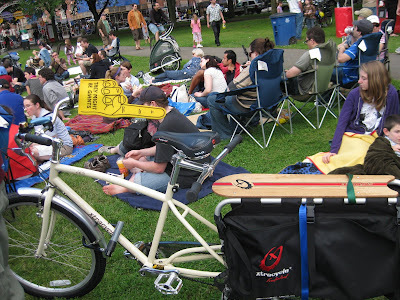 When the show ended, we easily stashed all our gear back into the cargo bikes, not-so-easily rounded up three spent little boys, and off we pedaled home-- feeling rather smug, I might add, watching all the other families dealing with hauling their gear over their shoulders, through the crowds, to their parked cars. Touring by bike is different from touring by car — you see more, for sure, but in a deeply sensory way, you experience more. There was nothing on this route that was especially earth-shattering — and yet from the vantage point of our bikes, it all was. The perfectly rolled hay. The acres of sunflowers. The stone walls. The sweet farmhouses. We passed our first farm, and remarked to each other how happy Provençal cows looked up close, well-fed and well-tended. We stopped to inspect our first olive grove. We pedaled past a lavender field, and soaked in the sweet aroma. We biked through Graveson and Maillane, two small Provençal towns, taking pictures of churches and cemeteries, where we read the inscriptions and wondered about lives lived. She had brought some cheese, and as we passed a farm with pear trees, she jumped off her bike, and grabbed two pears. That was lunch. Within an hour on the bike, the travails of Avignon were forgotten. We were happy again. Check out The Roads Warrior if you haven't yet-- a quick interview with Ray Lahood, the Secretary of Transportation, where he "talks about whether the one-car family is in the American future." President Obama has talked about his desire to wean Americans off automobiles. What we’ve talked about is getting to a concept that we call livable communities, where people don’t have to get in a car every day. You can use light rail, you can use buses, you can use walking paths, you can use your bike. But if Americans increasingly get around by rail, bus and bicycle, as you’ve planned, who will be buying cars in the future? I think everybody will have an automobile. I think it’s amazing in America when you drive around and look at new homes that are being built, there are three-car garages. I don’t think you’re going to see families with three cars. I think you’re going to see families with one car, possibly two. We're not carfree in our home. We're the one-car family model and I would like to believe that we can call ourselves a 'car-light' family now. However, looking around the web, we know he is wrong on the "everybody will have an automobile" line. Wednesday marks the last day of F's very first year of school. Perhaps given my own background in teaching, I always try to be particularly thoughtful about recognizing my children's teachers for all their hard work and care. Thankfully, so far the boys' school experiences have been quite positive so I haven't had any trouble sincerely thanking their maestras, and I always make it a point to hand write a note of gratitude. 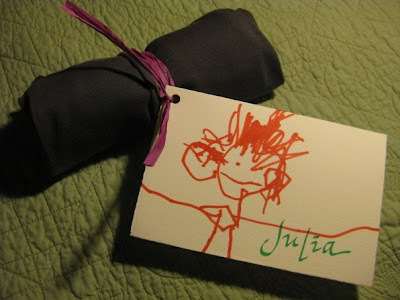 Because I know most adults really don't need another coffee mug and many teachers already have a stash of really nice smelling candles and/or lotions, I tend to lean towards gift cards (mostly for local book stores or ice cream shops) for the fellows' teachers. However, inspired by a recent freezer-paper-stenciling and wine-drinking-session with some friends, I decided to go a totally different route for F's four teachers this year. 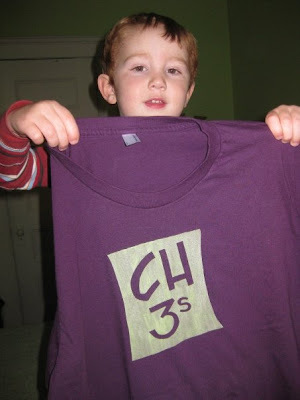 So on Sunday, I designed a stencil reading "CH 3s"-- the school's initials and 3s for the fact that he is in the three-year-olds' room, known as the threes' class. I first thought I would make it like an element listed on the periodic table which didn't really work. Then I tried to do a knock-off of the Superman logo, thinking that women who spend their days with a multitude of toddlers (and don't have a reality show paying them handsomely) really have well-earned such superhero status. The boys especially liked this, but it wasn't quite working for me. I ended up going very simple and created two stencils: one positive image and one negative one. I got to work stenciling two blank t-shirts from a recent bulk purchase I made from American Apparel (hand-stenciled shirts all around for gifts this year! ), but realized that I still needed two more shirts. 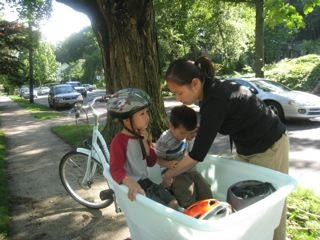 Yesterday as I headed off to school on the xtracycle Radish with the boys, I decided that I just couldn't face getting into the car later to hit a local-ish shopping center for two blank shirts. While I technically live in a city, much of my shopping (when not done online and much of my shopping is one online) has happened in the town just north of us. However, the strip in this town with the strip malls is far from bike friendly and I don't think I have ever seen a cyclist on this road. However, I realized that there's a bike trail that runs behind some of these shopping plazas and in fact, I could get to Old Navy by bike. So after school, off we set. I didn't know how far a ride it would be and I didn't know how long it would take us, but I have committed to biking instead of driving whenever possible. In many ways--especially on the hills-- I was glad we were on the xtracycle instead of the bakfiets. Getting to the bike path was a somewhat hairy ride but we did so in one piece. 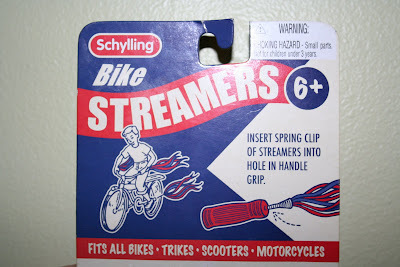 I did have to tell the guys a few times to stop screwing around on the back. Advantage bakfiets, here. Normally the boys hang out and read in the cargo box so are quite contented. On the back of the xtra, they have to pay a bit more attention, especially to holding on. In the baks, they can mess around and because that bike is so heavy, it really doesn't affect my riding. The xtra became quite wobbly though when the boys started their poking games. I think the words, "If you don't stop, I am pulling this bike over" may have left my mouth at some point during the first part of the ride. Once we were on the bike path, however, the ride became pretty idyllic. I now allowed C to stretch out his arms and yell rollercoaster-like, something I had immediately put the kibosh on when he tried it on a heavily-trafficked road earlier. It was so pleasant being on a paved road, lined on one side by trees, devoted only to bikes and the occasional dog walker. It was fun to cruise along not worrying about a whizzing four-wheeled vehicle buzzing by my left side. At some point, we did run into some police officers on foot who were clearly looking for something or someone but we didn't ask questions and just kept riding.